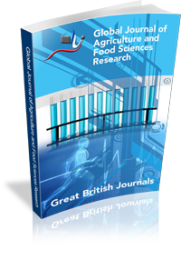 Global Journal of Agricultural and food Sciences Research is a peer-reviewed journal published by the British Research Institute, United Kingdom. Global Journal of Agricultural and food Sciences Research publishes original contributions at the forefront of new knowledge and techniques in the food sciences and particularly to serve the industrial and research communities by providing high quality refereed original papers. GJAFSR welcomes research papers in Agricultural Diversification, Agricultural Economics, Agricultural Engineering, Agricultural Geography, Agricultural Marketing, Agrophsics. Animal Science: Animal Breeding, Animal Nutrition. Agronomy: Plant Fertilization, Plant Science, Theoretical Production Ecology, Horticulture and other related areas. Papers submitted to this journal must be original, and are not considered in any other journals. GJAFSR publishes in both print and online versions. The online version of the journal is free access and downloads.